Remember the old saying “If you don’t have anything nice to say, don’t say anything at all”? For most children growing up in the 80s and 90s, this simple piece of advice was offered (and occasionally shouted) by depleted parents in an attempt to minimise relentless sibling bickering. Fast-forward to 2015 and ask a primary school student the same question. I did, and less than a handful of students had a vague memory of hearing “something like that”. Despite being more ‘socially connected’ than ever before, young people seem less equipped to navigate themselves out of difficult social situations. Perhaps the influx of outspoken celebrities brashly insulting each other via Twitter is causing the impressionable to think this sort of behaviour is normal; entertaining even. I can recall many a conversation with Mum about tolerating others when I was a bitchy, unsympathetic teen. “You don’t have to be their best friend!” Mum would plead, “just be civil. You’re never going to like everyone you meet”. Although I slipped up from time to time, I’d say Mum’s insightful words helped me get through high-school without getting bashed or completely shunned by vicious girl gangs. “So, what’s your point?” you may be wondering. In realising that my students were struggling to response appropriately to challenging social situations, I created a fun flow chart for them to refer to (I even laminated a pocket-sized version for them). When I introduced the chart, I told my students how I used to do lots of quizzes in magazines with the same format. E.g. Girlfriend Magazine circa 1998 ‘Should I cut my hair?’ Somehow my genuine love of flow charts convinced them that this was the latest and greatest way to solve social dilemmas. In fact, the pocket version has even been smuggled out of the classroom for home use. In addition to the chart, students were asked to anonymously write down three things other class members do that they consider to be annoying. After compiling their long and varied list of complaints, I invented a fictional character called ‘Annoying Al’. The concept of Annoying Al was very well received and the students even rallied for him/her to become a class puppet (student’s original designs pending). After discussing all of ‘Al’s’ annoying behaviours, we practised using the flow chart to help students identify the best outcome for each scenario. I explained that the red outcomes were considered negative, as they indicted that the problem was unable to be resolved without adult intervention. Whereas, if they arrived at a green outcome, students had fixed the problem maturely and independently. The serious offenses were decided upon as a whole class; influenced by our whole school rules. 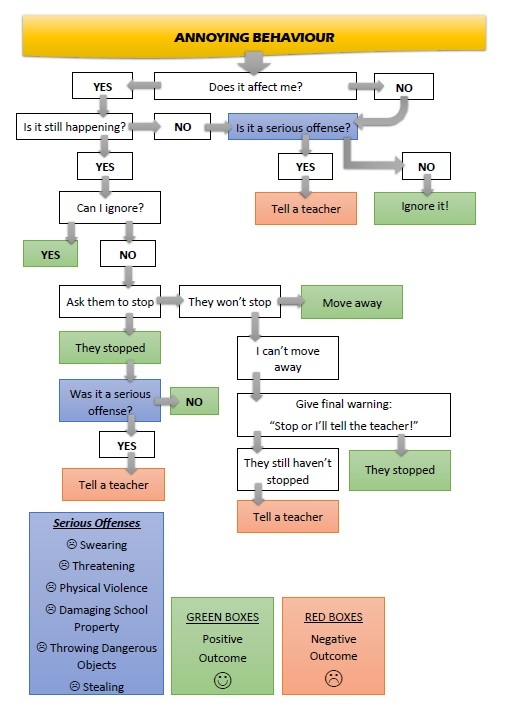 Before introducing the chart, students frequently complained to me about other students’ behaviour before even asking them to stop or making them aware that it was bothersome. As the somewhat petty complaints kept flooding in, my lessons were being disrupted, and rather than learning what to say, students continually relied on me to solve their problems. Last week we spent time role playing how to ask someone to stop and what to do if they don’t. Up until this point, I guess I assumed that some social skills were picked up innately over time. I now realise that when there’s such a mix of cultures, I can’t assume anything because my own cultural bias naturally affects my opinions. In this case, I needed to explicitly teach my students to use and listen for key words to ensure everyone could make sense of each other’s wishes. This was a valuable learning experience for me and I hope some of you find the chart useful. If you would like a large PDF version, please contact me via the form at the bottom of the page.